If you want to settle down in Quebec with your family, then you need to read till the end. There is a possibility that if you are applying for the Quebec skilled worker visa, then you need to apply alone. Yes, you read it right! You cannot include your spouse or your family in this application. But do not assume that you cannot get your family in Quebec. In order to move to Quebec with your spouse, you first need to apply for your Canada PR visa. Once you get your permanent resident visa, then you can sponsor your spouse and your immediate family. They can then join you in Canada. Why you may have to opt to apply alone? First of all, you need to understand that the Quebec skilled worker visa is a point-based programme. This visa lets you and your family stay and work in Quebec. But this is a point-based programme. The applicant needs to score minimum points in order to be eligible for the visa. If the candidate is married, then the minimum marks required, will be more. If your spouse does not have the right qualifications and skills, then you will not get any additional points. As a result, you may not be able to get the passing marks that are needed to be eligible for this visa. What the candidate can do is that he can apply alone and not include his spouse in the application. But he can get his spouse examined for Quebec immigration. Once the person becomes a permanent resident of Quebec then things become much easier. After becoming the permanent resident of Canada the person can sponsor his spouse. The spouse can then get the visa to migrate to Quebec. The emphasis of Canada’s immigration programmes has always been the reunification of families. They are taking many more steps in this regards. They want to make sure that the visa processing time for family visas is less. They are taking active steps in this regards. With many new changes coming in one can be hopeful that they do not have to wait for a long time to sponsor their legal better half. Readers must note that the details provided are only for immigration to Quebec. This does not include the Express entry programme. It can be very confusing for a person to understand exactly what he must do so that he can migrate to Quebec with his spouse. To get proper guidelines it is always better to check with Canada visa consultants of good reputation. When you consult a good visa consultant they will take into account all your details. That is, they will analyze your qualifications and skills. They will also take into account the skills and qualifications of your spouse. They will tell you if your spouse is eligible for the programme and if you can get more points. If your spouse is not eligible then they will give you the details to apply alone. Then once you become a permanent resident they will advise you on how you can sponsor your spouse for immigration to Quebec. 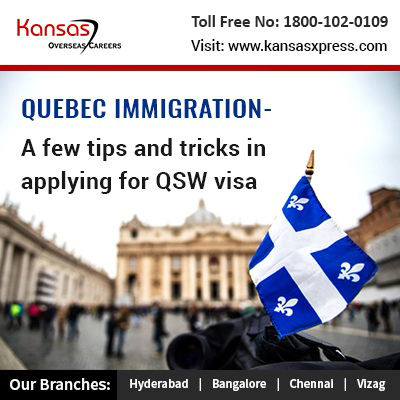 Contact Kansas Overseas Careers consultants for Quebec skilled worker visa process with best customer satisfaction. Good day sir/mam, how about working visa don’t you have, I want to work there, for now I’m working here in Saudi Arabia.